The Plitvice Lakes are a series of sixteen lakes interconnected by spectacular waterfalls, set in a deep woodland and populated by deers, bears, wolves, boars and rare bird species. A UNESCO World Heritage Site, the lakes are renowned for their distinctive colours, ranging from azure to green, grey or blue. The colours change constantly depending on the quantity of minerals or organisms in the water and the angle of sunlight. The Boiling Lake is situated in the Morne Trois Pitons National Park, Dominica's World Heritage site. 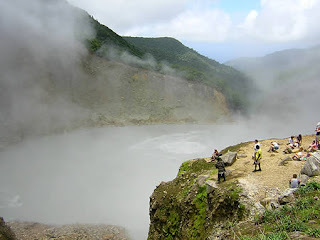 It is a flooded fumarole, or hole in the earth’s surface, 10.5 km east of Roseau, Dominica, on the Caribbean. It is filled with bubbling greyish-blue water that is usually enveloped in a cloud of vapor. 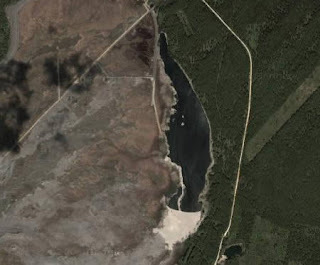 The lake is approximately 60 m across. 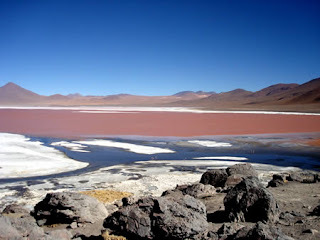 The Laguna Colorada (Red Lagoon) is a shallow salt lake in the southwest of the altiplano of Bolivia, close to the border with Chile. The lake contains borax islands, whose white color contrasts nicely with the reddish color of its waters, caused by red sediments and pigmentation of some algae. 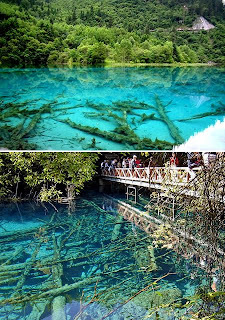 The Wuhua Hai, or Five-Flower Lake, is the signature of the Jiuzhaigon National Park in China. The lake is a shallow multi-coloured lake whose bottom is littered with fallen tree trunks. The water is so clear that you can see the trunks clearly. The water comes in different shares of turquoise, from yellowish to green, to blue. It is located at an elevation of 2472 meters, below Panda Lake and above the Pearl Shoal Waterfall. The Dead Sea is a salt lake situated between Israel and the West bank to the west, and Jordan to the east. It is 420 meters (1,378 ft) below sea level and its shores are the lowest point on the surface of the Earth on dry land. 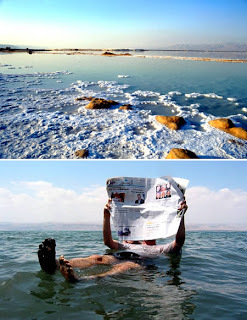 The Dead Sea is 330 m (1,083 ft) deep, the deepest hypersaline lake in the world. It is also the world's second saltiest body of water, after Lake Assal in Djibouti, with 30 percent salinity. It is 8.6 times saltier than the ocean. This salinity makes for a harsh environment where animals cannot flourish and boats cannot sail. The Dead Sea is 67 kilometers (42 mi) long and 18 kilometers (11 mi) wide at its widest point. It lies in the Jordan Rift Valley, and its main tributary is the Jordan River. The Dead Sea has attracted visitors from around the Mediterranean basin for thousands of years. Biblically, it was a place of refuge for King David. It was one of the world's first health resorts (for Herod the Great), and it has been the supplier of a wide variety of products, from balms for Egyptian mummification to potash for fertilizers. Lake Baikal is located in Southern Siberia in Russia, and it's also known as the "Blue Eye of Siberia". It contains more water than all the North American Great Lakes combined. At 1,637 meters (5,371 ft), Lake Baikal is the deepest lake in the world, and the largest freshwater lake in the world by volume, holding approximately twenty percent of the world's total fresh water. However, Lake Baikal contains less than one third the amount of water as the Caspian Sea which is the largest lake in the world. 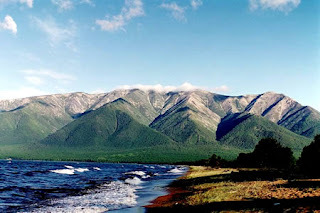 Lake Baikal was formed in an ancient rift valley and therefore is long and crescent-shaped with a surface area (31,500 km²) slightly less than that of Lake Superior or Lake Victoria. Baikal is home to more than 1,700 species of plants and animals, two thirds of which can be found nowhere else in the world and was declared a UNESCO World Heritage Site in 1996. At more than 25 million years old, it is the oldest lake in the world. 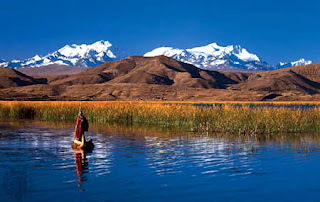 Lake Titicaca is a lake located on the border of Bolivia and Peru. It sits 3,812 m (12,500 ft) above sea level making it the highest commercially navigable lake in the world. By volume of water it is also the largest lake in South America. Lake Titicaca is fed by rainfall and meltwater from glaciers on the sierras that abut the Altiplano. 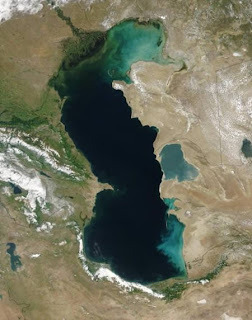 The Caspian Sea is the world's largest lake or largest inland body of water in the world, and accounts for 40 to 44 percent of the total lacustrine waters of the world. With a surface area of 394,299 km² (152,240 mi²), it has a surface area greater than the next six largest lakes combined. Crater Lake is a caldera lake located in Oregon; due to several unique factors, most prominently that it has no inlets or tributaries, the waters of Crater Lake are considered one of the world's most clearest. 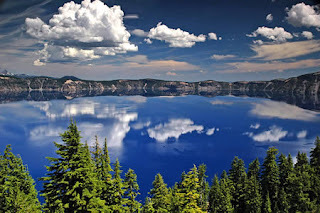 The lake partly fills a nearly 4,000 foot (1,220 m) deep caldera that was formed around 5,677 (± 150) BC by the collapse of the volcano Mount Mazama. Its deepest point has been measured at 1,949 feet (594 m) deep, making it the deepest lake in the United States, and the ninth deepest in the world. Lake Karachay is a small lake in the southern Ural mountains in western Russia. Starting in 1951 the Soviet Union used Karachay as a dumping site for radioactive waste from Mayak, the nearby nuclear waste storage and reprocessing facility, located near the town of Ozyorsk. According to a report by the Washington, D.C.-based Worldwatch Institute on nuclear waste, Karachay is the "most polluted spot" on Earth. The lake accumulated some 4.44 exabecquerels (EBq) of radioactivity, including 3.6 EBq of Caesium-137 and 0.74 EBq of Strontium-90. For comparison, the Chernobyl disaster released from 5 to 12 EBq of radioactivity, however this radiation is not concentrated in one location.